Plan your ideal vacation – add a spa package, juice or wine package, and other amenities. Then plan for the unexpected – purchase travel insurance to protect your perfect getaway. We strongly recommend vacation protection insurance. Cancellation penalties increase gradually and reach 100% of your trip cost in the last weeks before departure. Travel insurance provides coverage in most cases against losses caused by the cancellation or interruption of your trip due to job-related reasons, injury, sickness, or death involving yourself, a traveling companion or immediate family member. If you decline insurance, Holistic Holiday at Sea will be unable to assist you with refund claims. Get all of the information you will need to purchase travel insurance. Consider arriving to Miami the day before the cruise or leaving the day after your cruise. We have specially negotiated group rates at hotels near MIA/FLL. Learn more. February/March is high season in South Florida and fares will be rising. Find the lowest fares and book now before airfares rise. Add extra amenities to your cruise experience! 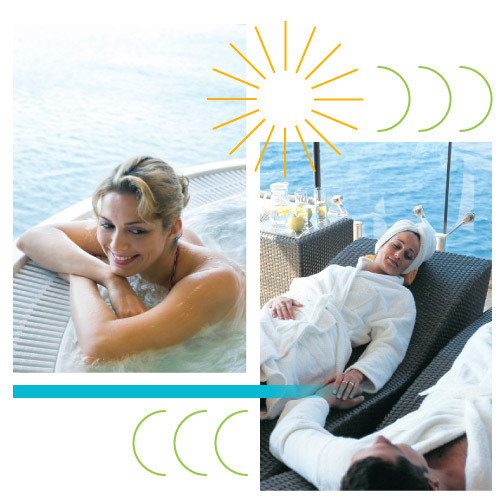 The Holistic Holiday at Sea cruise experience can be elevated with the purchase of extra services and amenities such as luxury suites, and packages for the internet, spa, and drinks! Find inner calm and rejuvenate your body in the thermal area of the Aurea Spa. The thermal pass includes unlimited use of the steam baths and sauna. Book online now and save – only $99 (onboard price is $115). Just use the code SPATLONG. Please note: preorders must be submitted at least 7 days prior to departure. Keep in touch with your world at sea! You can still connect to the net on the open seas, now faster than ever. You can choose to chat and post on your favorite socials networks, or surf the web and email family, friends and colleagues. Share your memorable videos and watch your favorite live television shows having full access at the highest speed. Plan in advance so there’s less to do once your cruise begins. Book your package now! Note: preorders must be submitted at least 7 days prior to departure. Enjoy vegan wine, fresh juices, smoothies, premium waters, and more! Many people choose to pair these specially selected vegan wines with our delicious plant-based dinners. Cool off in the afternoon with a drink from our exclusive vegan smoothie and juice package. By buying a wine or juice package, you will receive vouchers that can be used for any of the drinks on our wine list or our juice menu, but at a discounted price when compared to buying individual drinks or bottles. Pick out your package(s) using this pricelist and note the code(s). Packages can also be purchased onboard the ship. When completing the order form, only enter the drink package code and not a specific wine or other beverage selection.